SUMTERVILLE | “…I was in prison, and you came to Me,” Matt 25:36. Lent is a season that draws particular attention to the Corporal Works of Mercy. Yet how many of us get out of our comfort zones and visit the imprisoned? Father Richard Zuk was appointed in 2017 by the Diocese of Brooklyn to serve this facility as one of 9 chaplains of different faith backgrounds. He works with Father Vitalis Ozokpor, the other Catholic chaplain, and Father Gianni Agostinelli of the Diocese of Orlando, “to help proclaim the Good News to the captives” (Lk 4:18). Responding to a hunger for the Gospel and a deeper relationship of our loving God, Bishop John Noonan approved the transfer of the Sunday Celebration of Eucharist to be on Wednesday evenings in Spanish at the women’s minimum-security facility because of the growing need. 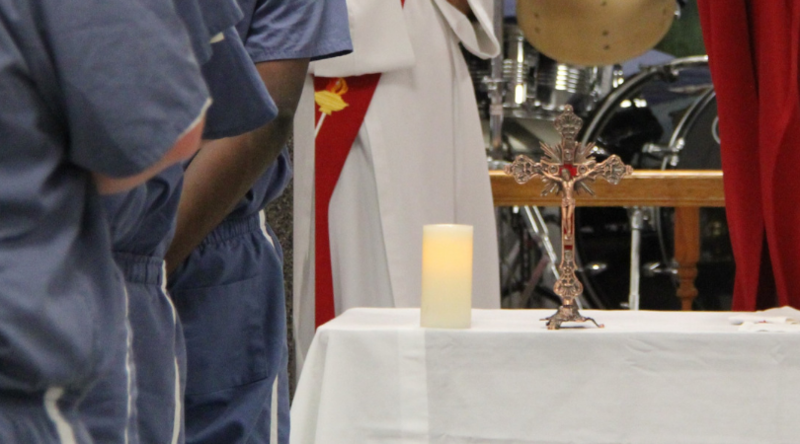 More than 50 inmates now participate in celebration of each Mass. It is his hope that with more priests, Mass times and opportunities to receive the Sacraments, these inmates will find strength in God and grow in His goodness. The bishop noted that we all have good and evil within us. The difference is in which one we feed. Previous Previous post: Please pray for the repose of the soul of Fr. Seamus Kuebler OSA, Prim.